This year, WWDC was held in San Jose. Tim Cook started by explaining that it was the most diverse WWDC ever with 5300 attendees coming from 75 countries. I have been invited by Apple as a scholar. This year, the ticket and lodging was offered by Apple to the 350 scholars. In this article we are going to see what are the updates for iOS, macOS, tvOS and watchOS, then we’ll have some other scholars explain us their playground and give us some advices and finally I’ll give my personal advices about attending WWDC. What’s New in iOS 11, macOS, watchOS and tvOS? First, let’s share some exciting announcements before I share how I and other developers got the WWDC scholarship. During the keynote, Apple introduced new softwares for the 4 major platforms : iOS, watchOS, tvOS and macOS. Let’s focus first on iOS 11 which is the biggest update of the four. With iOS 11, Apple is providing now two more APIs for developers and which are really interesting: ARKit (Augmented Reality Kit) and Core ML (Machine Learning Kit). These two kits are going to change a lot of things in the ecosystem. We’ll talk about these two kits after in detail. Let’s see the main design and features changes. The biggest change you can find in iOS 11 is probably the App Store, Apple redesigned it completely. It now will be featuring daily content like the App and the Game of the Day, developers’ stories or app premieres. One important point is also the separation that you can now find between apps and games. Apple finally separated the two categories to provide more accurate charts and sub-categories. Let’s move to Siri. Siri is becoming even more pro-active and with the use of artificial intelligence and machine learning, it will update user content in function of the user needs, for example with News which are going to be linked to your recent searches in Safari. Apple has also made a big UI design change with the Control Center which is completely revamped and now fits on one page. With the use of 3D Touch, user can access the more details or options on each of the actions available there. Craig Federighi also talked about a lot of new features that we won’t go into details but briefly, you can now send money with Apple Pay via Messages, there are new options on Camera and new effects for Live Photos, user profiles in Apple Music, a new Do Not Disturb while driving function and so on. Apple presented also the new version of macOS which doesn’t include many changes. It is called High Sierra, just a small update from the previous name Sierra. The main feature is the transformation of the file system, Apple created the APFS which features native encryption, a faster copying process and a protection from system crashes. It was already included in iOS 10 and is now available for macOS but the transformation of your files is not mandatory. High Sierra will also provide support for H.265 which will improve the battery life when playing videos in 4K. As in iOS 11, Siri is becoming more and more pro-active and will also use machine learning to learn about your preferences. Like macOS, there are not many new features in watchOS. There are now 3 more watch faces, one with characters from Toy Story, a kaleidoscope watch face and a Siri watch face which is intelligent and shows you your next events, how to go there, the time to go there and much more data. With this new version, the Apple Watch will be able to be synced with gym equipments which will give better data for health. These two kits are going to lead to some great possibilities with our apps. Let us go deeper into these. Core ML lets you integrate some machine learning kits directly into your app. This kit is already being used by Apple for Siri or for Photos for face recognition but machine learning doesn’t stop there. Apple’s Engineers gave us some examples of model types that are available which are very interesting : Sentiment Analysis, Handwriting Recognition, Translation, Scene Classification, Music Tagging or even Predicting Text. Editor’s note: If you want to learn more about Core ML, you can check out our beginner’s guide to Core ML. Although this sounds very cool and could get integrated in many apps, Apple emphasized the fact that Machine Learning was not for all apps, you have to find the right use for it.Nevertheless, the kit provided simplifies a lot the code that has to be created in order to use machine learning. ARKit, standing for Augmented Reality Kit, is a new kit which will lead to a better integration of Augmented Reality in apps. An example of use of this kit is the game Pokemon Go, it is using your camera to show you Pokemons in your environment that you can catch. ARKit is a complete kit which let developers create small games in AR but it is also calculating the distance. In order to get the WWDC scholarship, this year, we had to create a visually interactive Swift playground that can be experienced within three minutes. But we were judged not only on the technical accomplishment of the playground but also the creativity of ideas and finally the content of written responses to some essays. Let’s now talk with some scholars, and see what playground projects they have built. Antoine: Hi Ari, so is it your first time at WWDC? Ariana: No I was there in 2016 and 2017. Antoine: Great ! What did you create in your Swift playground? Ariana: I painted the searching and sorting algorithms in the AP Computer science test. So the playground sorted a paint palette and as the colors were sorted, they gradually appeared in the painting. Antoine: Nice, you must have spent quite a lot of time on it. Could you now tell me what was for you the best moment of the week? Ariana: My favorite moment was definitely getting to know all the scholars and working with them in the lounge and in the dorms. It is really cool to be in a place with so many talented developers you can collaborate with and the resources to make those projects possible (during sessions and labs). Antoine: So do you have any future plans for these projects after WWDC? Ariana: I have some games and a navigation app that are pretty far along that got a lot of advice from consultations at WWDC that I plan to release by the end of the summer. Antoine: Finally, are there any advices you would like to give to first-timers ? Ariana: Before you head to WWDC, make sure to start a new project or have a project you are working on (but haven’t finished) so that you can add the new frameworks released in WWDC and go to the labs/consultations. Antoine: Hi Liz, so is it your first time to “DubDub”? Antoine: Can you explain us what you created in your playground? Liz: I created a number guessing game originally called “Pig Cow Bull”, but because I couldn’t find a picture of a bull I changed it to “Pig Cow Dog”. Because the name includes animals, I decided to make it farm themed and created my own background using vector graphics. I also created a separate class for the game logic, and created a UI controller that controllers button presses and view changes. On the top I made a makeshift navigation bar. Antoine: That’s cool ! Since you won a scholarship with this playground, can you tell me what was the best moment of the week for you ? Liz: This is pretty hard to answer, because there were so many amazing moments during the week. Some highlights include talking to Apple employees and other developers (who are all so nice and willing to help ! ), getting boba almost every night at Boba Bar, seeing Fall Out Boy perform at the bash (#whathappensatthebashstaysatthebash), by accident buying a $170 app from another scholar (oops) and making friends with some of the most amazing, passionate, and exciting people I have ever met. If I was to choose a highlight it would definitely be talking to other Scholars. Antoine: Seems like you enjoyed your time there ! Any future plans after this experience ? Liz: WWDC has inspired me in many ways. One way is by showing me that the developer community is amazing. Everyone I met was extremely nice, outgoing, smart, and helpful. Being at a developers conference inspired me to start pursuing my own apps as well, such as Tour Me which I am making with some of my fellow scholars (keep an eye out for it at the end of the summer! I won’t give out any spoilers just yet…). Through WWDC I have also met a couple people who take networking to the next level, and they have inspired me to reach out and cold email people who inspire me. I will definitely be doing this in the coming days. Antoine: That’s really nice to know. As a newbie to WWDC, what are the advices you could give to other scholars who could come for the first time next year ? Liz: I know a lot of people tell newbies at “Dub Dub” to take advantage of labs, and I completely agree but I have even better advice to give. Don’t just go to labs, go talk to people instead! If you see anyone with a black Apple lanyard, go up, introduce yourself, and ask them what they do. Then just have a conversation with them! If you want to talk to people higher up, then go and sit in the front row of sessions. I sat in the front row of the Vision session this year, and I ended up sitting next to the Photos and Camera lead of Apple. I also met the team leader of the Machine Learning team, and a newcomer to Apple who sold his first startup for $43 million. Everyone was so down to earth and extremely interesting to talk to. So go out there, don’t be shy, and have some of the most interesting conversations you will ever have with people that you can only meet at WWDC! Antoine: Thanks Liz for your answers ! Antoine: Hi Aviral, I heard that it is your first time here? Aviral: That’s right, I applied in 2015, 2016 and 2017 and after a couple of rejections finally got Student Scholar Award for 2017. Antoine: Congratulations ! Can you describe me your playground? Aviral: Happoji is a cute emoji game which is simple yet addictive. The goal of the game Happoji is to click on Happy emojis which gives positive points while preventing to not click on the Sad emojis as they give negative points. The concept of the game is to look for positivity around. To win the game Happoji the user has to clear its 3 rounds. Each round is fun and is difficult then the previous one. Each round has a minimum score that user has to pass to be eligible for the next round within the given time. Different emojis give different points and pops up for different time, also after each round the number of emojis which appears on the screen also decrease. Antoine: That’s cool ! What was for you the best moment of the week? Aviral: There were so many best moments that one will feel bad to note a single one but at the orientation meeting Tim Cook and Esther Hare was the high point of the conference. Antoine: I completely agree with you. Any plans for the future? Like releasing Happoji maybe? 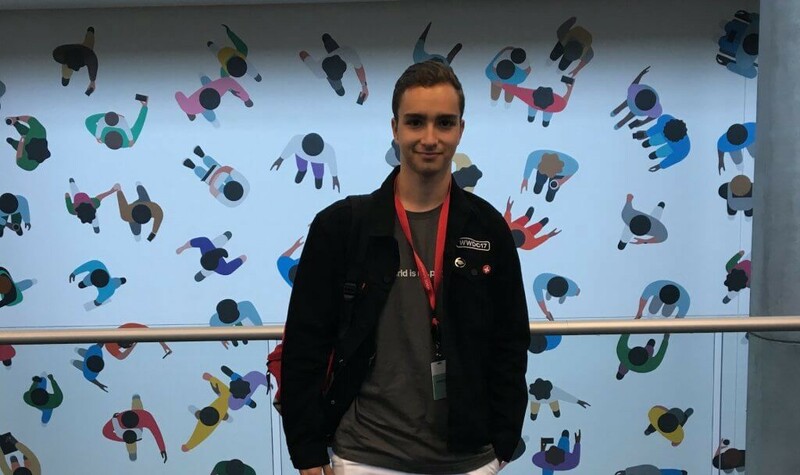 Aviral: I am currently in my final year of studies and I look forward to use the knowledge I got from WWDC and make some awesome Apps which people from around the world will use. Antoine: As you are, like many of the scholars of this year, new to “Dub Dub”, which advices would you give to other scholars? • Smile a lot, it helps to break the ice. • Talk to people and show care. • Listen to everyone and keep you eye open. • WWDC is a busy place and there are lot of things and other events going on all together. Do not try to get everything. Focus one thing at a time and do it properly. • Go for Labs more than sessions and Its better to have few projects. Ask whatever doubts you got even silly questions. They are happy to help. • Last and most important. Have fun. Antoine: Hi Kiera, so I heard that it is not your first time in WWDC? Kiera: No, I came in 2015, 2016 and in 2017. Antoine: Impressive ! What did you create in your playground this year? Kiera: I created a playground book that teaches kids how to code by walking them through the steps of building a whack-a-mole game. Antoine: Looks fun ! So for you, what was the best moment of the week? Kiera: My best moment of the week was being able to see the keynote live where they released all of the newest technologies. Antoine: I loved the keynote too, such an incredible moment. Do you have any future plans ? Maybe with some of the new APIs that were presented? Kiera: My future plans are to continue developing apps and hopefully get into the field of AI. Antoine: I’m sure you’ll be able to get there. Do you have one piece of advice for scholars? Kiera: One piece of advice I have is to not just take advantage of all of the sessions and labs available for you but to also make friends with the other scholarship winners who have similar interests as you. Antoine: Thanks Kiera for your time! Now, here are a few personal advices from my awesome experience there !